Here we explain how electric cars are an emerging technology and becoming more and more mainstream. We will go into detail, of how they work, how they will benefit you, and how you can buy and take advantage of an electric vehicle. EV’s are an emerging technology, that are becoming more and more prevalent in the market, an electric vehicle is more than just a Chevrolet Volt or a Nissan Leaf. Electric vehicles contain several different technologies, we are discussing any electrified vehicle including hybrid vehicles i.e. the Prius or a Ford Fusion Energy plug-in, a fully electric Tesla model S, or a fuel cell or gas generated electrical car. There are several different ways that an electric car can be configured, however the underlying base is always the same and that’s what we are going to talk about. An electric vehicle will have three basic components, they have the energy storage unit, they will have the control unit and they will have the propulsion unit. The important aspect is to understand how these three basic components work together to enable the electric vehicle to operate. In a typical electric vehicle the main power unit will consist of a battery, although currently a chemical battery is the most common, there are numerous other ways of storing the power for the electric vehicle. From the power storage the power flows to the controller (these may also be referred to as the power management system), the controller acts as a pipeline or gateway to the electric motor which will propel the car. The controller will do several things first, it modulates the power and keeps it even, and decides how much power is to be used. But also in most applications it will act as a converter, converting the power from one type to another, for example converting power from DC power to AC power, or increasing or decreasing power. The controller acts as the brains behind the power drivetrain. All of this acuminates in the electric motor which converts the electric power into physical energy or motion. 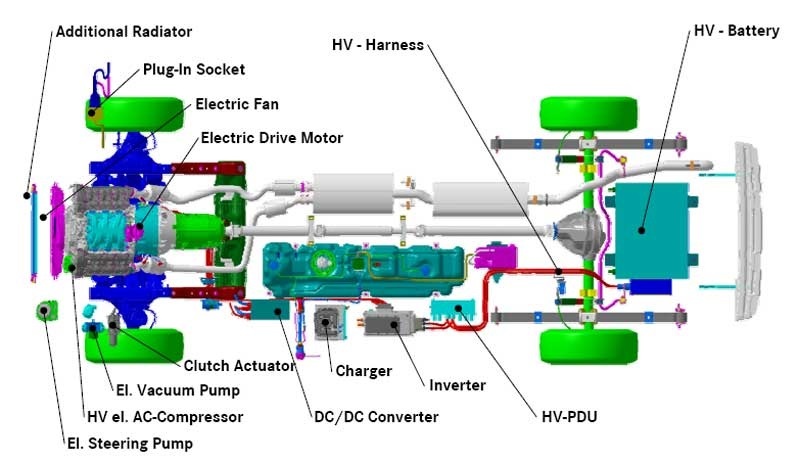 Some concept vehicles are designed where the electric motors are situated in the wheels, however most commonly a single electric motor is used as part of the drivetrain. Electric vehicles that do not use a battery tend to be called hybrid or other eco-vehicles, these use alternative ways of storing the energy this could be in the form of a hydrogen fuel cell , other fuel cells, or petrol & diesel. These vehicles can still operate in the same manner however the alternative fuel source is used to generate electricity and in turn power the controller and electric motor. Electric vehicles have far fewer moving parts than conventional cars using combustion engines and as a result, one of the long-term benefits is a reduction in maintenance and upkeep and electric car servicing. Most commonly electric vehicles store their battery packs under the main base of the vehicle, as the battery tends to be heavy this allows the main weight of the vehicle to be lower down, and means that the electric vehicle will have a lower centre of gravity, in turn this benefits the handling ability of the vehicle. Pure electric and plug-in hybrid vehicles need to be charged and feature a charging dock where they would be plugged in to the charging point. The power coming from the main supply will flow back into the controller and in turn, the controller allows power to flow back into the battery recharging the vehicle. 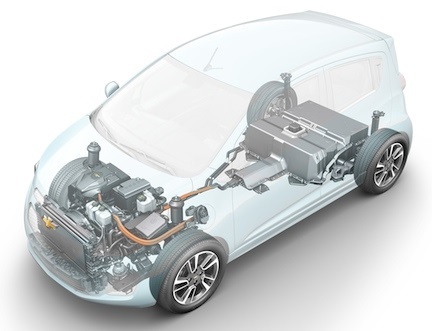 Most EV’s have improved operating efficiencies, by having some form of electric regeneration. There are three main ways of creating this, using flywheels, heat exchange or most commonly used, regeneration using the existing electric motor as a generator. This works by forcing the electric motor to spin in the opposite direction when the operator decelerates either by taking their foot off the accelerator or by pressing the brakes. The motor acting as a generator generates electricity that flows through the controller back into the batteries where it is stored to be reused; this conservation of energy is what makes electric vehicles so unique. As a result electric cars have various distances per charge capabilities this is referred to as their range, depending on the fuel size sizes, regeneration method, aerodynamic and other efficiencies. We have ranked the top electric cars based on the manufacturers recommended range per charge. Based on this we have established that the average electric cars including plug-in’s have a recommended pure electric range of 62 miles. As battery technology develops and improves, we will see significant increases in this. Follow here to find all our electric cars for sale!! !